Celeb Gossip News – Afghanistan Is the World’s Polio Capital. These Afghans Hope to Fix That. KANDAHAR, Afghanistan — At just 2 years old, Madina had been vaccinated seven times. It was not enough: When she fell ill this fall, a trip to the doctor in Kandahar City confirmed that she was among the latest Afghan toddlers to contract polio. Almost a million children in Kandahar Province alone, like Madina, need at least one dose of oral vaccine a month to head off the disease, health workers say. But many of them also live in the most violent and socially disrupted parts of southern Afghanistan, where the Taliban control large areas and do not want government health workers going door to door. These realities make a sustained vaccination campaign brutally difficult for health workers here. And Afghanistan, one of three countries where polio is still endemic, is losing ground. Officials have registered 19 cases of polio so far this year, up from 13 each of the previous two years, according to World Health Organization figures. In August, I followed a polio vaccination crew in Kandahar and saw how, even in areas where health workers have been able to function, many things stand in their way: security fears and drought, deep poverty and stifling tradition, widespread illiteracy and superstition. Still, starting just after dawn each day, the vaccination teams are at it, hoping to reach just a few more children. Mawlawi Abdul Rashid of Kandahar City, a religious scholar and member of one team, said most of the residents were poor and desperately worried about what their children would have to eat each night. Drought adds to the daily burden, with families in many neighborhoods having to buy water from tankers after wells dry up. Mohammad Shah, 38, said that as a vaccine campaigner in the city he had been visiting more than 100 houses a day in temperatures reaching 100 degrees Fahrenheit. He said some families asked for food and other necessities instead of the vaccine — a need that Mr. Shah, a father of five, said he understood. “They keep asking us to bring them wheat, soup and other staples,” he said. Despite efforts to have religious scholars express support for the vaccine, Mr. Shah said mistrust about it still existed. Many worry about whether strict interpretations of Islam allow the vaccine. Some question its contents and believe conspiracy theories that Westerners have manipulated it to cause infertility. Abdul Razaq, 65, who was administering the vaccine in the Loya Weyala area of Kandahar City, which is dominated by people displaced by fighting, said around 10 of the 200 families there refused it. Most families here hold traditional views wary of letting outside men enter a home if no male family members are present. For that reason, the health workers try to have at least one woman on each vaccination team. But there are not enough female workers, and all-male teams are frequently turned away. Across Afghanistan, more than 10 million children require polio vaccine. The United States, Canada and Japan are among the largest donors for the vaccination drive. The vaccinators’ days are long. They start early in the morning, gathering in health facilities of each neighborhood of Kandahar City to collect the vaccine and vitamin E tablets, which they carry in plastic coolers. Teams then head out in rented taxis or on motorcycles, armed with lists of families in their areas that have children younger than 5. They go door to door, circling back after a break for lunch and prayer to the houses where children weren’t home in the morning. At one house, a woman insisted that she didn’t want her 3-year-old daughter, Mursal, to be vaccinated. She wouldn’t give a reason, but the workers suspected she was worried for religious reasons. Each member of the three-person team tried to persuade her, even reading from a book of religious declarations that allowed the vaccine. The last member of the team to try, Mr. Razaq, was blunt: If you keep rejecting the vaccine, he asked, will you be able to take care of your daughter when she contracts polio? He pleaded, insisting that he was religious, too, but still made sure all his young children were vaccinated. At last, he got through, and Mursal received her dose for the month. That was enough at one house: A woman there said no to the vaccine, but the boy with her wanted a balloon — so he got both it and his dose. But bigger fears at work here than children’s distaste for medicine. Many families know the Taliban are suspicious of the government vaccination drive, and worry that they will become targets if they are seen allowing the health workers into their homes. Zabihullah Mujahid, the Taliban spokesman, said that the insurgents were not against the vaccine and that they supported administering it in areas under their control. But they will not allow government teams to go door to door in their areas, saying they believe the workers sometimes act as spies. 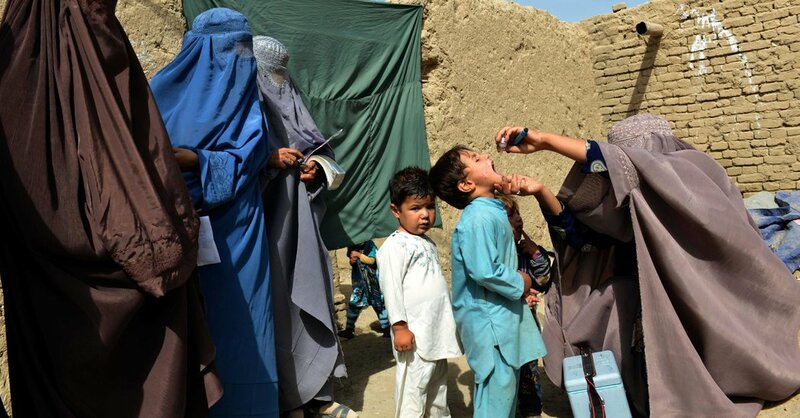 The Taliban usually insist on distributing the vaccine centrally from mosques. But health workers say only a house-by-house approach can come close to ensuring enough doses are distributed each month. Mr. Shah, who has been administering vaccine for 12 years, said that as hard as this year had been, it was getting better, at least in his area: Last year 25 families there rejected the vaccine. This year, that dropped to eight. “When I see a polio victim, I feel very sorry for him and I understand that’s why my job is so important,” Mr. Shah said. Officials, though, lament that progress is so halting despite all their efforts. Abdul Qayoom Pokhla, head of Kandahar Province’s public health department, said that even without the stress of war, eradicating polio there would take at least one or two years. “We need a secure environment to implement the polio vaccine campaign,” he said. Mujib Mashal contributed reporting from Kabul.